NASA’s always had a knack for making the wonders of science look like incredible art; gazing at their various high-def visions of the universe is awe-inspiring to the highest degree. In addition to its incredible command of the cosmos, the agency has also spent the past fifty years commissioning terrestrial creative talents to find inspiration in its behind-the-scenes happenings. The NASA Art Program was launched in 1962—a mere four years after the organization itself was founded—and a set of images from the archives has been uploaded to Flickr. The selection gives a distinctly human perspective to the oft-mind-bending realities of exploration beyond earth, in the form of illustrations, sketches, paintings, photos, and more. 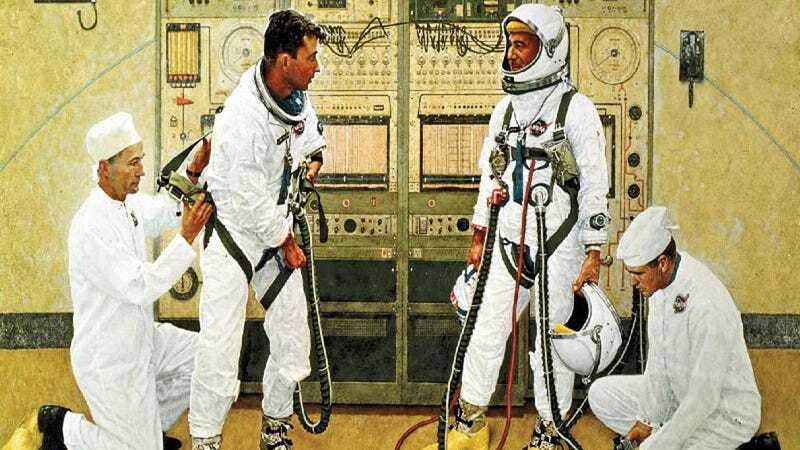 Paul Calle's pencil sketch Suiting Up shows members of the Apollo 11 crew on July 16th, 1969. He was the only artist present. Jack Perlmutter's 1969 Moon, Horizon, & Flowers (Rocket Rollout) is a mashup of NASA tech and Florida palms. When Thoughts Turn Inward by Henry Casselli in 1981, a watercolor of astronaut John Young during suit-up. Fred Freeman painted the acrylic-on-canvas Saturn Blockhouse in 1968. First Steps, by Mitchell Jamieson, is an acrylic, gauze, and paper on canvas depiction of astronaut Gordon Cooper emerging back onto solid ground after 22 turns around the world on the Mercury spacecraft. Lead image: Grissom and Young by Norman Rockwell, 1965.